The following is a 100% authentic, 100% real review. Dadtography was not provided complimentary product or compensated in any way for this review. Travel offers the ability to see so many new and unfamiliar places and road tripping lets you explore a local area like no other form of travel. Dadtography (John and Daniel) were able to visit a gem of a breakfast and lunch establishment during a road trip to the Indy 500 in downtown Chattanooga, TN called the Maple Street Biscuit Company. Step into this charming biscuit haven with us and enjoy one of their made-from-scratch biscuits and a fresh brewed cup of coffee. Be sure to view our video in high definition! I have to first comment on Chattanooga’s downtown. We had spent the night before in Atlanta, GA and got up early for our day on the road. We were planning on visiting Rock City as part of our trip from Atlanta to Indianapolis for the 500, but made an unplanned stop in Chattanooga in an effort to find some breakfast (and coffee). If you haven’t been to downtown Chattanooga, it’s definitely worth a stop. Downtown Chattanooga was a surprise to us – it was a quiet Saturday morning as we were wandering around downtown. There weren’t many cars or people out and about yet. Naturally, we turned to Google for a “best breakfast in Chattanooga” search. A few places popped up and then I saw one that mentioned “biscuits”. We were able to see a good amount of the central Chattanooga as we found our way to Maple Street (Biscuit Company). I definitely can’t wait to spend more time in central Chattanooga, and may plan a trip to stay down there in the near future. I found the website ChattanoogaFun.com that seems to offer a good bit of information on the area. 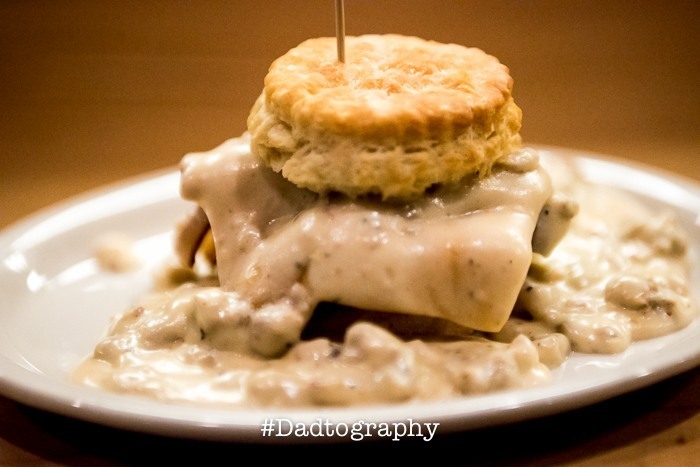 In keeping with the above thoughts on Chattanooga in general, I found the downtown location of Maple Street Biscuit Company to be perfectly situated and overall just a great experience to be found inside the city. It seems like downtown Chattanooga is a fairly walkable city, and not terribly large, so “getting lost” wasn’t much of a concern really. Maple Street really nailed the look of this store, though. It’s got that simple yet modern feel to it, not unlike many of the “fast casual” restaurants that are becoming popular these days. I liked that you can see where they roll the biscuit dough from just about anywhere in the restaurant. The space was open with lots of light from the front windows pouring in. The layout was inviting, no matter where you sat (I’d choose a spot facing out the front window). Overall, I thought the “experience” of eating here matched or even contributed to the food and can’t wait to return to this store again sometime. I had my heart set on breakfast biscuits that Saturday morning in downtown Chattanooga and let me tell ya, Maple Street did not disappoint! I took the time to first watch them make a fresh batch of biscuits (that took discipline), which they were ever so kind to let me video. The care and detail that they put into making their biscuits absolutely shows in the taste. Maple Street gave me the best biscuit I’ve ever eaten (sorry, honey). The only thing I’m disappointed about is how far I have to travel to get my next one! When you enjoy working somewhere, I think it really comes out in how you treat and interact with your customers. If you like what you do and where you work, you’ll be happy. When you’re happy, you treat people better. My experience at Maple Street made me feel like I walked into my aunt & uncles house as they were making biscuits for breakfast that morning. They welcomed us in (also fairly common in fast casual), greeted us with smiles and offered to answer any questions or provide suggestions, and let us watch as they made up a fresh batch of biscuits. You can tell this is a well-run company, because everyone had the same attitude and I could tell no one had to “fake it”, either. Overall, Maple Street was one of my favorite breakfast experiences I’ve had over the past 5 years or so. The food was awesome, the store was fantastic and the people made me feel like I should come back and say “hi” again soon. Maple Street is clearly building a biscuit experience and not just a restaurant chain. I encourage you to try them out – going a little out of the way for a place like this is well worth the “trouble”, I promise! Best Biscuits in the South! Only breakfast and lunch hours, currently.